These are the big lights on the north – facing roof. There was some concern expressed that they would create a cold spot in this area. Plus, as I may have mentioned, years of condensate drippage plus a little full – on leakage caused the attic floor to rot. So really, extra little ones plus three big ones? Yeah, of course I want that. So in they went. I think they will be fine. The temperature is even throughout the space. I think no cold spots translates to no condensate. Despite hours of pouring rain and winds that drive the rain horizontally, there are no leaks. Well done, guys. They placed windows to provide views of the brick chimneys. They laser – aligned the bottoms of the windows. They refrained from rolling their eyes when I said the window placement had to look right from outside the house, too. And, not least, they had the expertise to rework a slate roof with a complex slope to remain watertight while accommodating the skylights. I like my crew. Is this going to be your design studio from where you will be running your inspirational workshops on how to renovate in style? Thanks. If I had style, I’d need a little style lab, right? Labs are big in Paris right now. We could run classes for insane expat renovators. Actually, when you think about it, that could be fun. Thanks. I can’t wait, either. Those windows have been a long time coming. 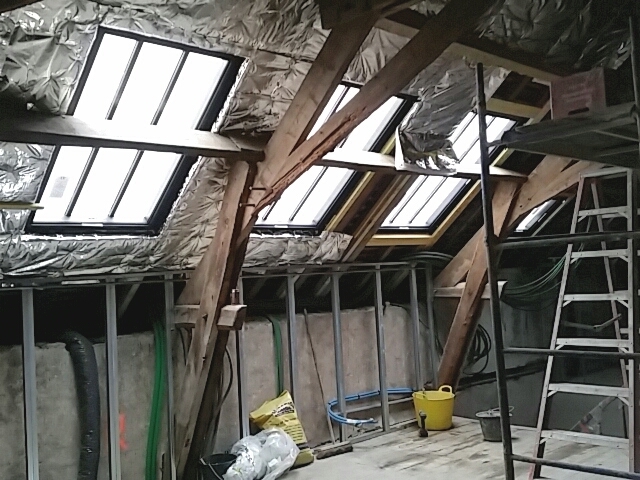 these skylights should fill the space with light – looks wonderful! Thanks. This is north light on very dark day. This summer I might wonder what I was thinking but right now I’m quite pleased. Fortunately I think I found just the fabric to save me on those too-sunny days. Great looking house….I hope you realise that you’r creating a near perfect studio light! Thank you, Roger, and yes, absolutely, that was one of the main reasons I wanted those windows. The back wall of the house faces roughly NNE. I fell for the house while I was still in California but when the realtor opened the shutters and that cool north light filled those rooms, that was it. I knew I had found my new home. Paying for the renovation will have me eating rice and beans for a long time but that’s okay.